Throughout North America, the Gyro sandwich is associated universally with Greeks. For a product which did not exist until the late 1960’s, it’s as easy to locate today as the venerable American hot dog. At Hellenic festivals all across the country, Greek Americans have learned to have a separate serving line for this extremely popular item. The enduring mystery is, where did the Gyro come from? It was not a sandwich brought with the 1880-1920 wave of Greek immigrants to America. So who created or brought this sandwich to our shores? Yet the larger question of the mysterious origins of the Gyro does not end there. Except for local communities, few today recall that, long before the Gyro, there was another kind of fast food sandwich associated with Greeks. Since at least the 1920’s, and perhaps long before, variations of the Greek Hot Dog have been sold around the country. Many an American diner and/or restaurant chain still sell Greek Hot Dogs. The popularity of the Greek Hot Dog, far from a local delicacy, has – if we are to believe the Internet – reached all the way to Singapore, where local restaurants proudly offer Greek Hot Dogs on their menus. For all those who would but look, documentation abounds for the existence of the Greek Hot Dog. True, there is little agreement about its origins or precise recipe, but as we shall see, in large measure, the same can be said for the Gyro. Published sources, community memories and seemingly endless variations on the recipe can be noted. Spiced meat is the central theme of both the Greek Hot Dog and the Gyro. How did one sandwich nearly fade from popular consciousness, while another has become internationally identified with Greeks? Folklorists and food historians have long recognized that a single sandwich can have regional variations on a common culinary theme. As a case in point, “the modern American submarine sandwich, sub, hero, wedge, hoagie, grinder, Italian sandwich, Po’Boy, torpedo, zeppelin… and their heated cousins, the Philly cheese steak, Chicago Italian, beef sandwiches, Binghamton, New York speedies” are all essentially the same “overstuffed meat, cheese and vegetable oblong shaped sandwiched between Italian or French bread (www.foodtimeline.org).” The same variation-on-a-theme pattern applies for the Greek Hot Dog. The Greek Hot Dog is a standard hotdog in a bun served with a spicy, sometimes semisweet, topping. The progression of variants within the broader field of Greek Hot Dogs follows a regional dispersal (as they do for other sandwiches). Since no agreement exists on where this sandwich was developed however (and there probably never was one single location), we will simply begin by discussing what seem to be the two polar points of the Greek Hot Dog: the Coney Island and the Greek Chili. The Coney Island and Cincinnati Greek Chili variants on the Greek Hot Dog seem linked, but let’s take the stories and recipes about these two sandwiches and break them down slowly. Many sources point to a myth of origin for the Coney Island version of the Greek Hot Dog. As the story goes, some unknown Greek immigrant working at a hotdog stand in the Coney Island Amusement Park wanted to increase his lackluster business. This Greek innovator concluded that what would improve the regular hotdog, and so make it sell better, was to change its toppings. Since this is a fast-food sandwich, and not chemistry, the following recipes can only be understood as variations on a theme. The common ingredients for the Coney Island, Greek Hot Dog, Greek Hot Sauce, Greek-style Chili, and all the rest is hot dogs, chili, cheese, onions and, at times pasta. Obviously, the new taste, and so great secret of the Greek Hot Dog and its variants, is in the exact ingredients which make up this spicy meal on a bun. In the move to Cincinnati, which many say the Coney Island sandwich made, there was yet another innovation. The “Coney” stayed as a hotdog with the “Greek sauce,” or Greek-style chili, served on top. The new variant saw this sandwich served with additional layers. This layering became known, depending on the restaurant, diner or region, as the “two-way,” “three-way,” “four-way,” and “five-way.” The “two-way is a sandwich served on a bed of spaghetti, with oyster crackers on the side. A “three-way” is chilidog topped with an extra large serving of shredded cheddar cheese. The “four-way” and “five-way” are further elaborations with the hotdog, chili and pasta still the core group, but with added optional beans, chickpeas and/or additional seasonings/spices. With so much innate variation cited, “core recipes” can be difficult to provide. Having said that, allow me to offer one basic Greek Hot Dog Sauce receipt, and then one of the most elaborate expressions of the Cincinnati version of Greek chili available. These formulas alone should provide some idea of how extreme the differences from one serving of this sandwich can be from another. Brown two pounds of hamburger in oil. Add two quarts water and 2 teaspoons pepper. Stir in remaining ingredients and cook for 4 hours (c.f., www.cooks.com). For those who have grown up with these sorts of sauces, this particular recipe leaves out cocoa. Cocoa is the one ingredient that unquestionably separates Greek chili from nearly all Texas styles of chili. It is well worth pointing out that traditional Mexican mole sauces are a mixture of various chilies with cocoa and chocolate. As a quick point of interest, I should note that there are even Texas-style Greek Sauces. No less a source than the Associated Press published an explicitly Cincinnati-style five-way Greek chili recipe which was seen in newspapers throughout the country. Saute ground beef, onion and garlic in large saucepan until ground beef is browned, about 5 minutes; add spices, herbs and cocoa and cook 1-2 minutes longer. Stir in tomatoes, beans and honey; heat to boiling. Reduce heat and simmer, covered, 15 minutes; uncover and simmer until thickened, about 15 minutes. Spoon chili over macaroni in bowls; garnish with green onions, feta cheese and olives, as desired. Makes 8 servings (about 1 cup chili and 2/3 cup macaroni each. NOTE: Any canned or dry-packaged bean variety man be substituted for those listed here. While the Coney Island sandwich is served at hotdog stands around the nation, Greek-style Chili was picked up by fast-food restaurant chains such as Skyline and Gold Star. Point of fact: Greek Coney Island Sauce, Greek Hot Dog Sauce, or variants are certainly not limited to the Cincinnati area. On the Internet, in cookbooks and elsewhere, one can easily find recipes for, say, the “Detroit Greek Coney Island Sauce,” or other variants. As Greek-owned candy stores once lined the main streets of major cities and small towns all across North America, so too did the small diner, restaurant and hotdog stand. Just as Greek immigrants changed the ice cream and confectionary business with innovations such as the Dove Bar, the turtle, or the invention of soft ice cream and frozen custard by Tom Carvel (Carvelas, 1906-1990), so too have Greek immigrants creatively altered American culinary tastes in other realms. Nicholas D. Sarakatsannis, a young Greek immigrant, arrived in Cincinnati, Ohio in 1917. Having already worked a number of jo bs in New Hampshire, Sarakatsannis was looking for something new. Restless, the young Greek moved through various sall towns in Ohio, working alternately as a cand maker or owner/operator of a Coney Island stand. In 1928, Sarakatsannis was married and back in Cincinnati, this time working for another Greek at the Empress Chili Parlor. Knowing he could come up with a better chili recipe. Sarakatsannis moved to Newport, Kentucky. Once there, Sarakatsannis opened the Dixie Chili Parlor in an 8 x 30 foot room just north of Eighth Street. Dixie Chili proved to be an instant success. While Sarakatsannis only made eight gallons of chili on his first day, this family-owned company now makes some 150 gallons a day. 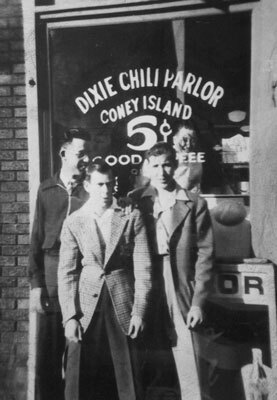 After 74 years, the Dixie Chili is a thriving, family-owned and operated business run by two of Nicholas Sarakatsannis’ sons – Panny and Spiros, who bought out their brothers George and Chris. Spiros is president of the company. There are three company-owned locations in the greater Cincinnati area (Newport, Erlanger, and Covington, Kentucky), as well as a franchised restaurant in Independence, Kentucky (www.dixiechili.com). Today, the Gyro is identified with Greeks all across America, but years ago, and in places far outside the five boroughs of New York City, Greek Hot Dogs and Greek-style Chili are still avidly sought-out culinary delights. The Gyro also has a definite history, of course, from which many have profited by, but which few really know about.